€40 went to Raymond O'Leary, Josephine Dineen, A Hurley, Kieran Madden, Malachy Harrington. Jackpot for next weekend will be €2,800 and the draw takes place in The Kilbrittain inn. Numbers drawn were 20, 26, 30, 31`There was no winner. €40 went to Pat Lawton, Seinna Long, Bernie Lyons, Anne Harrington, Josephine Dineen. Christmas bottles went to: GKCME, Liam Ryan, Hamilton Madden, Kieran Madden, Ger Ahern. Jackpot for next weekend will be €2,600 and the draw takes place in The Amber Bar. Numbers drawn were 4,15,16,27. There was no winner. €40 went to Annie O'Neill, E&J, Danny McCarthy, ET/MON & Gang, Peter O'Mahony. Christmas Bottles went to: Ann & Timmy Hurley, Philip Bennis, Shane & Darragh & Ryan Healy, Fionnuala Fogarty, Ann Hodge. Jackpot for next weekend will be €2,400 and the draw takes place in The Amber Bar. 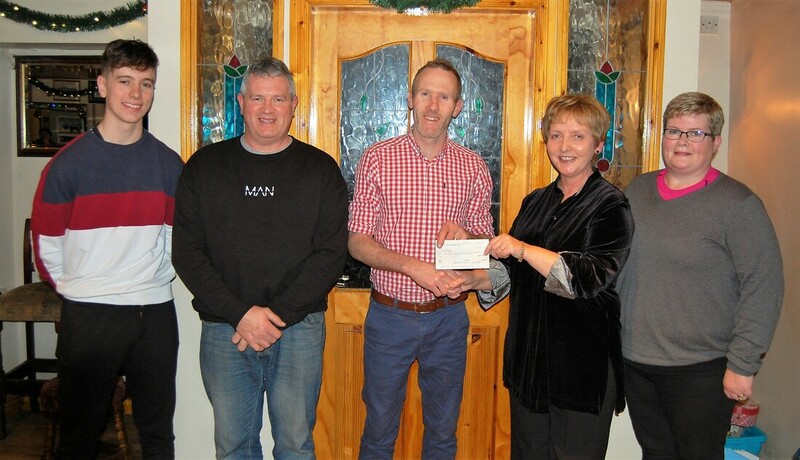 Presentation of €5,800 was made to Ann Hodge. Also presentation of €250 to seller Ger Hodge. Included in photo are from left, Gavin Hodge, Ger Hodge, Denis Ryan Chairman, Ann Hodge, Sharon McSweeney, outgoing Treasurer. €40 went to John Dollard, Eimear Hayes, Alan & Hitomi Healy, Josephine Dineen, Sandra O'Regan. Jackpot for next week will be €2,200 and the draw takes place in The Amber Bar. Winner was Ann Hodge. Congratulations to Ann. €40 went to Chris Ryan, Donal Og, Eileen Scannell, Tom O'Donoghue, Micheal O'Mahony. Jackpot next week will start at €2,000 and the draw takes place in The Amber Bar. €40 went to David Desmond, Diane & Emmet Quinlan, Dan & Mgt Collins, Fehilly Family, Con Healy. Jackpot next week will be €5,800 and the draw will be in The Kilbrittain Inn. Numbers drawn were 12,14,21,24. There was no winner. Next Jackpot will be €5,600 and the draw will be in The Kilbrittain Inn. Numbers drawn were 2,10,12,30. There was no winner. Next Jackpot will be €5,400 and draw will take place in The Kilbrittain Inn. Numbers drawn were 4,11,19,27. There was no winner. €40 winners were Phil Collins, Kieran Madden, Charlie & Oisin & Cara O'Sullivan, Anthony O'Regan, Mgt Desmond. Next Jackpot will be €5,200 and the draw will be in The Kilbrittain Inn. Numbers drawn were, 11, 17, 24, 25. There was no winner. €40 winners were Tadgh O'Mahony, Catriona O'Neill, Teresa O'Driscoll, Moloney family (Barleyfield), Fintan Crowley. Next Jackpot will be €5,000 and the draw will be in The Kilbrittain Inn. Numbers drawn were, 7, 8, 24, 29. There was no winner. €40 winners were Molly O'Brien, Robbie & Edel O'Flynn, Mary P O'Brien, Owen Sexton, DanJoe Holland. Jackpot for next weekend will be €4,800 and the draw takes place in The Amber Bar. Numbers drawn were 3, 14, 21, 22. There was no winner. €40 winners were Noel & Stephanie Butler, Conor Hogan, Edward Sheehy, Orlaith O'Mahony, Kieran Madden. Numbers draw were 25, 26, 27, 31. There was no winner. €40 winners were Pat McCarthy, Lar Sexton, Mary Anne Coughlan, John Dollard, Dan Collins. Jackpot for next week will be €4,400 and the draw will be in The Amber Bar.